U.S. money production in January picked up from December and a year earlier, data from the agency responsible for printing currency shows. 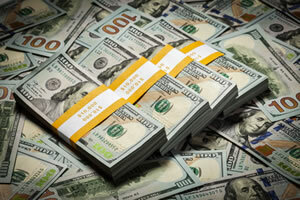 518.4 million in $1s, $2s, $5s, $20s, $50s and $100s were produced last month, accounting for a combined value of nearly $12 billion, according to the latest figures from the Bureau of Engraving and Printing (BEP). These figures compare to December totals of over 462 million notes worth more than $11.8 billion. The number of $1s was the same for both months. Similarly, both months lacked $10s. Before then, $10s had been printed monthly since May 2014. Compared to the January 2015, the number of notes jumped 15.4% from 449,104,000 and their combined value soared 90.9% from $6,278,480,000. The BEP printed 3.2 million in $20 star note. Star notes are replacements for misprinted or damaged notes and for certain serial numbers like 000 000 000. Star notes have serial numbers that end with a star "*" designation, and are also so indicated by quantities in the images above. Money collectors usually find star notes more desirable since they can be harder to find. Interesting … the pattern of more $2 bills and fewer $10 bills continues. I still haven’t encountered any two’s in circulation although my bank does give them out if you ask. But I’m still receiving multiple fives in place of tens, which is becoming increasingly strange. Any thoughts on this mystery CoinNews readers? Thanks for compiling these many stats & your analysis! @Munzen : a possible explanation for the lack of $10 bills could simply be inflation coupled with the fact that ATMs require withdrawals in $20 increments. If one’s average small purchase (i.e. less than $20) has climbed above $10 (which is not difficult to do anymore), a $10 will not be needed in change. This may be what is impacting their production. I find in my experience that cash is tendered typically for small purchases, especially ones which appear to be unplanned and credit/debit cards are used for larger or planned purchases. When I do give out $10 bills, it’s usually from purchases that force customers to tend another $20 bill as they have crossed into the next $20 tier (e.g. $26.89; $45.17; $81.15; etc. ).